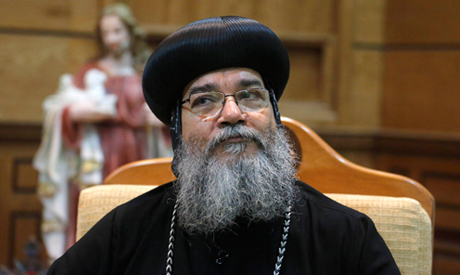 Unidentified gunmen shot at the car transporting the General Bishop of Upper Egypt’s Minya governorate on Monday, reported Ahram's Arabic website. Bishop Makarious’ car was shot at while on its way to one of the churches of Abu Qurqas. The Bishop and the driver were both unharmed after the driver managed to speed away to escape the shooting. In August, sixteen rights groups issued a joint statement expressing "grave concern regarding the increasing sectarian violence which has targeted Christians and their churches since the June 30 uprising,” which ousted president Morsi. While there have been many attacks against churches reported since Morsi's removal from power on 3 July, the most comprehensive wave of attacks was triggered by the dispersal of two main pro-Morsi sit-ins in Cairo and Giza on 14 August, with many of the attacks occurring in Minya in Upper Egypt, where almost 50 percent of the population is Coptic Christian. The Egyptian Center for Public Policy Studies (ECPPS) stated that in the wave of sectarian violence in August, 28 churches and monasteries were attacked in the governorates of Fayoum, Beni Suef, Minya, Assiut and Sohag, as well as five Christian associations in Minya and Fayoum. Additionally, attacks on Coptic property were estimated to have damaged 122 shops, 51 houses and five schools, according to the NGO's September report. Much of the recent sectarian violence has been attributed to supporters of Mohamed Morsi, although the group has officially denied such claims. Critics have also questioned the lack of government protection and compensation following attacks.